The Epson Expression Photo XP-850 Small-in-One Printer’s talents may lean toward photos, but along with the superior image quality, it’s also a full-featured, fairly fast color inkjet multifunction (MFP) with automatic duplex printing and scanning. Its $300 price (as of 01/22/2013) is steep, but it includes other premium features, like CD/DVD printing. The Expression Photo XP-850 is generally a joy to use. Setup is easy, and the touchscreen and contextually lit buttons, plus nicely thought-out menus, make operation simple. The software is the current standard Epson bundle that includes the company's venerable Epson Scan, as well as Abbyy FineReader 9.5 Sprint for OCR chores. There's also mobile printing via e-mail and Wi-Fi. By ‘generally a joy’ we mean that one of these first days, Epson needs to fix a long-standing push-scan issue. This is at least our third printer from the company that has required either tweaking the Windows firewall, or waiting for a number of minutes, before PCs on the network will show up as scan destinations. No other vendor's printers suffer this issue. Paper and media handling are top-notch for small volumes. Duplex printing is automatic, and augmenting the 100-sheet main paper cassette and 20-sheet photo cassette is a rear, single-sheet vertical feed that allows straight-path (no bending) photo printing. The automatic document feeder (ADF) holds 30 sheets and supports automatic two-sided scanning. The scanning platen itself is letter/A4-sized, and the lid telescopes a small distance to accommodate magazine-thick media. Optical media may be on its way out for some, but on the bottom of the Expression Photo XP-850, you'll find a removable adapter for feeding printable CD or DVD media. The adapter inserts into a slot above the 50-sheet output tray. Before we quote speeds, note that upping the photo-printing setting from ‘Photo’ to ‘Best Photo’ slows output to a glacial pace, with little improvement in quality. At default settings, monochrome text and graphic pages print at an aggregate 7.1 pages per minute (ppm) on the PC and 6.8 ppm on the Mac—average times. Snapshot-sized (4-by-6-inch) photos print at above-average speeds of 4.6 ppm to plain paper and 1.6 ppm to glossy paper. A full-page color photo prints at about 0.4 ppm--a shade slower than average. The Expression Photo XP-850 uses a six-ink system that adds light magenta and light cyan to the usual cyan, magenta, yellow, and black. While the individual ink costs are slightly cheaper than average overall, the cost potential is higher when you have six inks in play rather than four. The standard-capacity $10.99/240-page black and $10.99/360-page colors are 4.6 cents per page and 3 cents per page, per color, respectively. The high-capacity $19.99 black lasts for 500 pages and the $16.99 color cartridges, 740 pages, which work out to 4 cents per page and 2.3 cents per page per color. 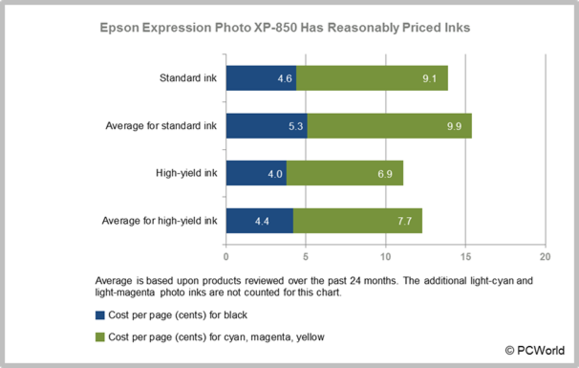 The Epson Expression Photo XP-850's inks are reasonably priced. Because there are six of them, however, your page might end up costing a bit more in the end. While you pay a lot for the ink, it's worth it when you print photos. The color palette is generally cool, but the Expression XP-850's glossy prints show very nice detail and overall color accuracy. Most users will like what they see. Text printed on plain paper is sharp, but the dye-based ink means that larger fonts and black areas tend more towards dark-gray. The weakest aspect of the Expression XP-850's output is color graphics printed on plain paper, which look washed-out. The Epson Expression Photo XP-850 would work well as a photo printer that will occasionally double as an office MFP. It’s at least one feature better than the Canon Pixma MG8220 Wireless Inkjet Photo All-In-One, which lacks an ADF. The HP Photosmart 7520 e-All-in-One Printer is a comparable and worthy alternative with a lower price tag.